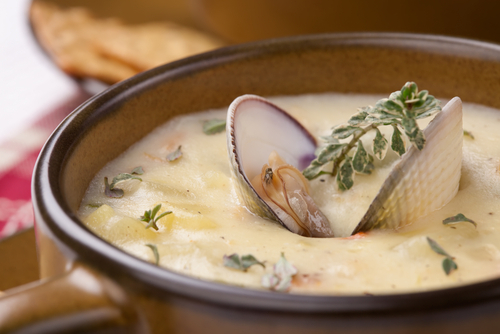 Chowder is a thick soup whose name originated from the French word 'chaudière'. 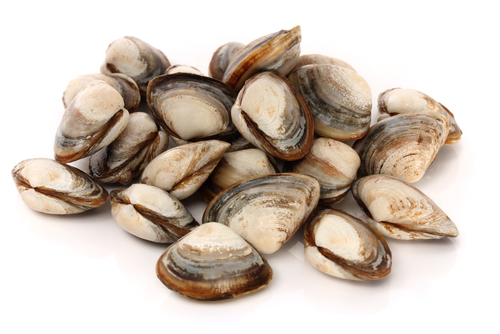 There are many different types of chowders, such as corn, potato or fish, but the best-known variety is made with clams. It is a specialty dish from the northeastern region of the United States. Manhattan clam chowder includes tomatoes in the broth while New England clam chowder is cream based. Breton fishermen who migrated to New England from Newfoundland most likely invented chowder. The soup base used the parts of the fish from the day's catch that they couldn't sell. It was combined with available ingredients in large cauldrons. Over time, it became a staple in the northeast and began appearing on restaurant menus. First, drain and chop the clams, reserving all liquid. While the clams are draining, fry the salt pork in a heavy pan until all the fat is cooked out. Then, add the onions and the celery and brown lightly. Add the butter and let it melt. Next, stir in the flour and stir constantly for five minutes. Finally, add the clams, potatoes, clam liquid, milk, bay leaf and thyme. Cook until the potatoes are tender. If you want to turn it into seafood chowder, just add fish or shellfish. Serve with crackers.